Dr. Tom Deans delivers an inspiring and motivational speech to business owners around the world to explore the business exit plan that’s right for them. Using the Willing Wisdom process and key messages from his international bestselling book, Every Family’s Business, he shows audiences how to transition the wealth and wisdom of a business to the next generation. His speech addresses the reservation that many business owners feel toward the idea of leaving family significant wealth versus an operating business. His use of humor, story-telling and data leaves audiences understanding that great families and high functioning relationships are built one conversation at a time. 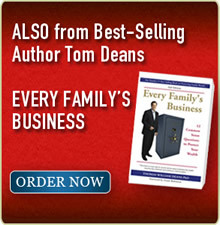 By encouraging family to pursue their own authentic dreams, Dr. Deans shares how business owners can leave family something more valuable than money when a business is sold. Themes: Themes: Business Exit Panning, Business Culture, Inspiration, Family, Friends, Community, Discovering Your Legacy, Living a Purposeful Life, Aging, Raising Authentic Children, Preparing Heirs.